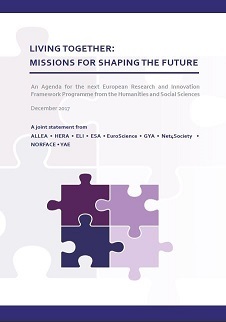 The ALLEA Horizon Europe Working Group aims to develop suggestions for the EU’s future research and innovation programmes which will be initiated after the conclusion of Horizon 2020, the EU’s current programme on research and innovation. Following the decision of the 2016 ALLEA General Assembly in Vienna, the Group was set up as a successor to the ALLEA Working Group on Social Sciences and Humanities (WGSSH). The Working Group seeks to continue to ensure that any successor research programme to Horizon 2020 is developed with the interests of the Wissenschafts community in mind and in particular to ensure that the Social Sciences and Humanities are fully represented. • Taking into account at all times the position of the humanities and the social sciences in any post-Horizon 2020 research and innovation programme(s).